The flat broom that most folks have nowadays is a relatively new invention. Prior to around 1835 (give or take a decade or two – odd that there weren’t more broom historians keeping track of such things), people used round brooms. Pressing the broom flat and holding it there while stitching it just wasn’t that easy or fun. In the mid 19th century, the Shakers developed a broom press – like a large woodworker’s vise – to hold the broom flat while it was stitched. For a long time a flat broom was called a Shaker broom. Why do I call a round broom a besom? Cause it’s easier than calling it a round broom and there’s a bit of history behind it. Is it accurate? Not really. 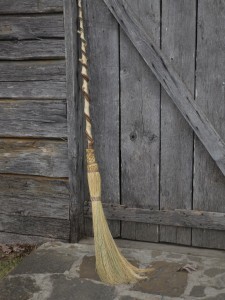 A true besom would be made of twigs and bound with leather or white oak or hickory bark. How is it pronounced? Depending on who you talk to and where they came from, it has a half dozen pronunciations ranging from “beesum” to “bayzun.” I generally stick with the “bayzun” pronunciation ever since I was visited by a German immigrant that was quite irate that I should pronounce is the other way. What’s it used for? Why, it’s used for sweeping. However, since it’s generally a lot longer than a regular broom – it’s left untrimmed (I used to trim ‘em, but was corrected by an Irish immigrant) – it tends to work better when the side is used. 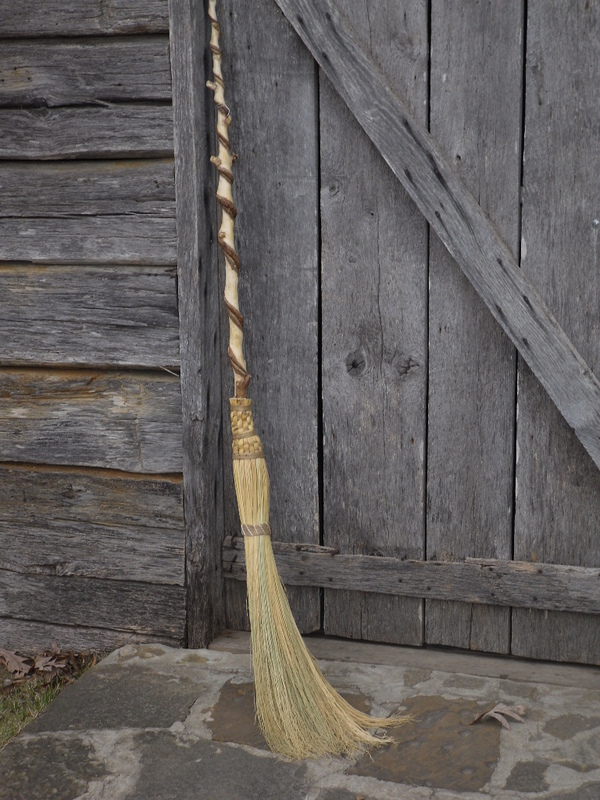 Great for getting into those hard to reach spaces, too… sort of like the cob web broom.